As this is a column about a newspaper, specifically the Boston Globe, allow me to begin with a clarification. I am not an employee of the Foxboro Reporter, never have been. I’m not on staff; I don’t attend their editorial meetings, and at times have even written opinions which were contrary to the Reporter’s own ideas on a subject. For 13 years I have been very grateful to Jeff, and now Bill, for allowing me the opportunity to FREELANCE for the paper and for the privilege of them allowing my words to occupy a space on page 5. It has been, and continues to be, a true honor, and I hope to continue our association for a very long time. That said, there WAS a time I DID work for a major newspaper, but not in the capacity you might imagine. 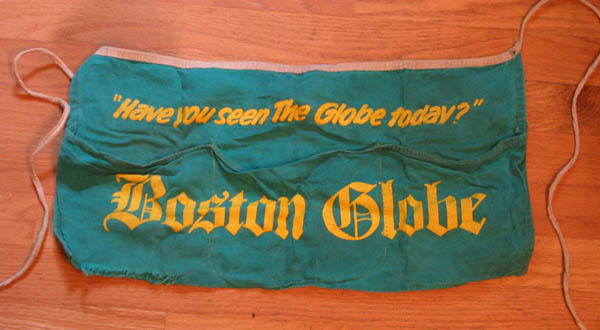 Back in 1980, right around this time of year, I started selling papers for the Boston Globe. I wasn’t a paperboy — I was actually in the city of Boston, peddling the Globe for 20 cents to passing cars. The pay was good for a 15 year old back then — $4.25 a day for two hours of after-school work, plus 6 and one half cents per paper sold. Less than a week after I started, I got my permanent spot outside Woolworths Department store in Downtown Crossing — where I would stay for three years until I had outgrown the job and left at age 18. I learned to dress in layers very fast. I loved working for the Globe. I loved being at that bustling corner, getting to talk to people (especially the cute girls) and getting over my shyness of speaking with people in general. Yes, as hard as it may be to imagine now, I was a very shy kid. I remember the friendliness of so many customers, particularly Joseph Phil Kelley, who chatted each day, shared his wisdom, and even gave me 50 cents each day for the 25 cent paper. He was just a great guy. There were many others who were also kind, and many folks who would stop by just to chat. I even dated several of the girls who came by. I was never sure if he was setting up a jail cell rendezvous for the evening or knew about my lengthy police record, but whatever. I was also regularly entertained by a woman named Mrs. Stern, who would stand on the corner and use some of the foulest language I ever heard, swear at everyone for two hours, then get on the bus and go home. The fruit stand guys, the Cogliani family, were there in the summer and sort of “kept an eye on me,” but in the winter I was on my own. I was thrilled when Dad allowed my sister Theresa to also sell papers; she was right around the corner from me and we shared many hot chocolates and cookies during those days. In the summer months, we’d even ride our bikes into Boston every day to sell our papers. Now, back in 1982, it was the Boston Herald that faced an imminent death, and I recall talking to my Globe boss, Joe Wallus, a really great guy, about it. As we did our nightly count and pay-out in truck 128 at Government Center, I commented that the likely Herald closure would probably be good for the Globe. But Joe surprised me by saying it wasn’t good; that a one-paper town was never a good thing, and the city needed a variety of news sources. He was right, then and now. We older folks remember when it was the NEWSPAPER where we got the very latest news, the league standings, the stocks, and so much more. And back then there were so many to choose from: The Herald, Globe, Post, Traveler, Record, American, and so many others — each with its own point of view (or bias) and each with its own strengths and weaknesses. ALL newspapers have a bias — as do ALL news sources. But having so many disparate news sources was — and still is — the only way to understand a subject from all sides, and glean the truth that is always somewhere in the middle. This is why I read the New York papers at least once a week, and always pick up a local paper when I travel outside the state — it’s the best way to get the pulse of a community. And newspapers have an historical value that no web site can ever achieve. I still have the newspapers my dad collected when JFK was assassinated, when Armstrong set foot on the moon. I kept all the papers from the Blizzard of ’78 and when Challenger exploded and when President Reagan was shot. Each of these is valuable not just for the front page stories, but the entire paper is a snapshot of another time, from the “latest” styles to the prices of cars to the extinct comic strips to how the Red Sox were doing back then. There is so much to learn from the “breaking news” of an era by reading it AS IT WAS WRITTEN and not distilled by decades of rewrites. What did everyone go out and buy on September 12, 2001? Newspapers. What were people standing in a four block line in downtown crossing to buy the day after the 2004 Red Sox swept the series? Newspapers. We don’t save web pages. We save Newspapers. Despite how the web has changed the future of newsprint, and despite declining advertising revenue, there is simply no substitution for holding a newspaper in your hands and reading it. It is my sincere hope that the Globe — and the Herald, and the Foxboro Reporter, Dorchester News, Boston City Paper — and the industry — survives and prospers. Humor: The missing William Shatner scene in J.J. Abrams Star Trek 2009! → ← Silver Age Comics: Spanking your super kids, a great reason for Superman not to marry, and Cluck Kent! And we still hate Lucy Lane.